Dcamel’s mission is to travel to Lembongan Island in the quickest and most luxurious way possible. 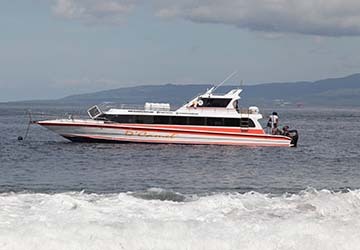 Utilising their powerful vessel in an effective manner, the Fast Ferry makes the crossing from the white sands of Sanur to Nusa Lembongan in just 30 minutes. Up to 80 passengers can enjoy the sailing in the knowledge they are catered for by reliable and responsible staff, with a collection of safety equipment available. Part of the appeal for travelling with DCamel is the efficient manner in which passengers are ushered onto the boat, and the spectacular views once onboard. The modern boat affords extremely comfortable seating areas, allowing passengers the chance to sit back and relax as they bask in the stunning surroundings, comprised of gorgeous beaches, endless blue seas and breathtaking coral reefs. As good as the onboard experience is, the company’s standout feature is the free transfers from the harbour to your resort, ensuring each passenger travels in a safe and secure environment. After employing a host of experienced staff and constantly supplying flawless crossings, DCamel has established itself as one of the standout operators in Indonesia. Use directferries.co.uk to find Dcamel Fast Ferry timetables, prices and to book Dcamel Fast Ferry ferry tickets. Looking for the lowest fares for your destination? Don’t worry, we’ll also compare Dcamel Fast Ferry with alternative ferry companies.